Social: Why Our Brains Are Wired to Connect is a great companion piece to Quiet: The Power of Introverts in a World That Can't Stop Talking, but then again, a lot of books complement Quiet. I'm no good at explaining things, other than, "It's a book about the brain. Put it in your face and read it!" so I'm going to put some of the book's description up. Based on the latest cutting edge research, the findings in Social have important real-world implications. Our schools and businesses, for example, attempt to minimalize social distractions. But this is exactly the wrong thing to do to encourage engagement and learning, and literally shuts down the social brain, leaving powerful neuro-cognitive resources untapped. The insights revealed in this pioneering book suggest ways to improve learning in schools, make the workplace more productive, and improve our overall well-being." If you are the type of person who enjoys learning the technical reasons why our brains do the things they do, kick in an extra star. I'm not a big fan on all the small details, but I absolutely loved all the concepts. Matthew D. Lieberman does a phenomenal job explaining the complex ideas into clear language, as well as adds the community implications on what we as as society are doing correctly, and what could be improved upon. There will never be a section where the concept is too abstract. 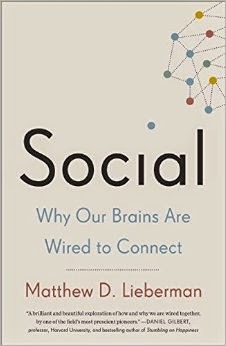 Social is one of the most easily readable books about the brain. I believe self-awareness is the most important skill we can learn and apply to ourselves, so the more we learn about ourselves, the easier and more effective we can apply that knowledge. Learning how when we value money, causes us to abandon social connections, but when we value the limited amount of time we have to live, we abandon work and seek social connections. That our emotional pain and physical pain are one in the same, meaning words are just like sticks and stones, if we allow it and when we can't help it. By the end of the book, it feels like every topic that could be touched upon has been visited. Social is well worth a read and if this type of material interests you, a great book to own.